The Greatest Films can't be measured scientifically because greatness is extremely subjective. The artistic greatness of films (and other works of art) can never be rated or quantified, although critics, reviewers, and fans still make ten best lists, hundred best lists, all-time greatest lists, favorites lists, awards lists, and generate results of polls. Over a long period of time, it has been found that the English-language films found here in this selection of 100 Greatest Films repeatedly appear on all-time best film lists and are often noted in the collective responses of film viewers. Arguably, there is reasonable consensus by most film historians, critics and reviewers that these selections are among cinema's most critically-acclaimed, significant "must-see" films (of predominantly Hollywood-American production). These 100 choices were limited to English-language, theatrically-distributed, narrative feature films. [Note: That means foreign-language films, documentaries, TV movies and mini-series, and short films were not considered.] Emphasis in these selections is purposely directed toward earlier, more classic Hollywood/American films (and other English-language films) than more recent films, although some recent films (and British films) are included. These are films that give us pieces of time that we can never forget. They have the power to entertain, enchant, inform, and move us emotionally - and change our perceptions of things. The films below range from the earliest defining silent films of Hollywood, to all the genre types (screwball comedies, westerns, etc. ), and to the blockbusters and epics of today. These 'Greatest Films' refuse to fade from memory even after the long passage of time - they share the unifying fact of being seen and talked about decades after they were made. Many of these Greatest Films were made many years ago, and overlooked when they were first released, yet they have endured the test of time. 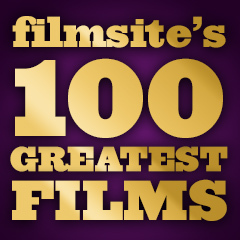 This selection of 100 Greatest Films in the last century of film-making - identified throughout the site by a yellow star - covers, by conscious choice, a wide range of genres, decades, stars and directors. They are film selections that have undoubtedly left an indelible mark upon our lives and reflect the defining moments of the last 100 years - films that give us pieces of time we can never forget. Detailed analysis and synopses for each of the Greatest Films include memorable movie quotes and lines of dialogue, and great moments or scenes. Each review of a film in the 100 Greatest Films collection also includes a "Top 100" graphic label or designation. All film criticism is extremely subjective and there is no such thing as the definitive list of the 100 Greatest (English-language) Films. In a sense, anyone who watches a film is instantly a film critic. Therefore, everyone will have their own favorites, choices, or other criteria for selection of the greatest films, and some may disagree with at least some of the selections below. The Greatest Films selected do not include foreign films or non-English language films for purposes of specialization and focus. Negative judgment on foreign films or non-English language films is not intended or implied. The lists (and links to reviews) provide your own private film studies course or a crash course in cinema literacy. 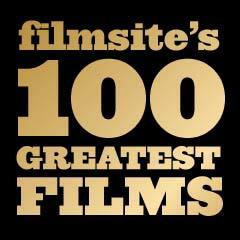 A compiled, chronological listing of all film choices is indexed at 200 and 300 Greatest Films. These films were chosen with very specific Selection Criteria - further explained in another section of this site. These crucial film selections have undoubtedly left an indelible mark upon our lives and reflect many defining moments of the last 100 years. Filmsite has also created many other variations in its Greatest Film Lists. A second and third group of Another 100 Greatest Films and Third 100 Greatest Films were added to the original list, expanding the list from 100 to 200 -- and then 300 film -- selections.